December 23, 2009 - Believe it or not, this obsessed runner has a treadmill. Believe it or not, this obsessed runner has a treadmill but I only use it when the weather is so nasty that even I wont go out. Im happy to report; I have run on it once in 3 years and hope not to need it again this winter! Get out there! The holiday week is busy but for most of us, the insanity is behind us and getting in the run just became a lot easier, especially on days off work! The best way to celebrate? In my case, with a very neglected Long run! Randy Step, an obsessed runner heading out the door, today and everyday! 2010, Running Fit celebrates 25 years of commitment to Michigans Running Community! 25 years of running passion and we are as excited about what we do as when we ran our first 5K! We are also happy to report that despite the economy, Running Fit continues to invest in Michigan. In 2009, we moved, built up and updated the Novi and West Bloomfield locations along with the purchase and renovation of a building on the west side of Ann Arbor for our headquarters, warehouse and new retail store. In 2009 Running Fit the event company launched 2 new triathlons, 2 new Dances With Dirt trail runs and added Run Woodstock for a total of 23 annual events. Running Fit has been creating jobs hear in Michigan and in 2009 broke the 100 employee mark. Your commitment to Running Fit and the sport of running has made this happen. Thank you for running and investing in Michigan and making it possible for us to live out our dreams! The crew at Running Fit, at your service and ready to fit you up in 2010! March 5, 2008 - Running Fit supplies Kenyans with running gear. Dances With Dirt sells out again! This proves that Well it proves something, perhaps it has to do with runners needing to get their butts kicked, bodies scratched, bitten and bruised All in good fun! What am I talking about? Check out www.danceswithdirt.com, the dark side of running. We are just 2 weeks away from the kick off of the spring racing season, although Mother Nature has been draggin her feet. The Saint Pats day runs are the early test to see who has kept in shape through this messy winter. Not that these races are taken too seriously and usually involve a post race trip to the bar, but its fun to kick off the dust and get started. A great choice is the Shamrocks & Shenanigans 5K, 2 mile and kids dash in Ann Arbor, March 16th. Shamrocks has a fun and exciting course that loops and loops and loops Conner ONeills Pub, the event sponsor. All proceeds go to Save a Heart Foundation at C.S. Mott Childrens Hospital. We have 2 weeks to get ready, no sweat! For more information visit our website www.runshamrocks.com. Tribal conflicts in Kenya these past few months have been brutal and the death toll has included some notable Kenyan runners. A friend of mine, Joseph Codgington, has been helping get athletes out of Kenya and to the United States, a risky and bureaucratic task. Joseph is putting them up in his home in Ann Arbor and Running Fit has stepped up to help by supplying footwear and running gear. The athletes arrive here with not much more than the clothes on their back. 2 of the 4 athletes he is bringing in arrived Saturday and came by Running Fit on Tuesday to get fitted up. Check out the story at http://codgie.com/running-fit-sponsors-kenyan-runners.htm, these two guys look like a couple of kids on Christmas morning with all their new toys. Welcome to the snow Richard and Philip! (They really liked the hats!) In next weeks midweek email, we will announce dates that the Kenyans will be at our stores, joining us for runs and telling their amazing stories of how running got them out of Kenya and here to Michigan. For more Run Reading, click here: Burned Out? No Way! All it takes is sunshine, good footing, no wind and temps above 25 to make Michigan a great place to run the other 300 or so days of the year are to make us tough, arghhh! Join me this Saturday, March 1st, at high noon in Hell, Michigan for a very stupid, very fun run. (No fee!) A traditional 4 mile slog, jog through the woods with a few hundred runners and no wimps in sight! Actually the run will start at 12:45 after the legendary Dances With Dirt Team Relay sign up. You dont have to sign up for DWD to join this run, BUT WHY NOT TRY! 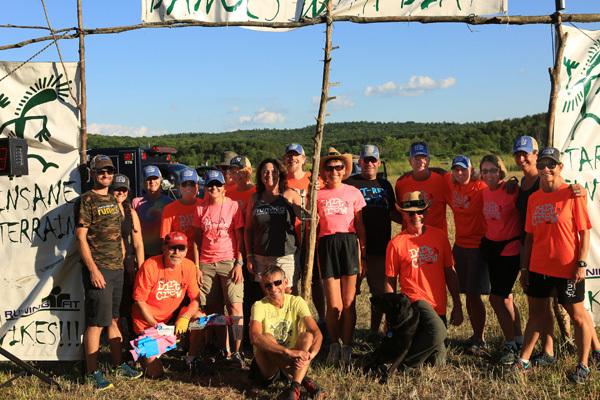 Seriously, for those of you who have not ran on a DWD team, I can guarantee it to be one of the most fun and memorable events of your running life. The actual event is September 6th but it will sell out this Saturday. Go to www.danceswithdirt.com, click on Hell, then scratch your head in wonder! Last week I yanked my Achilles pretty good while running an ice covered trail. I limped around all day thinking, this might be trouble. I rubbed on some topical Ibuprofen cream several times over the next couple days and have been running pain free ever since. Anyway, Im the biggest skeptic when it comes to snake oil but I think this stuff actually might work. I didnt even mean to make this a shameless plug but if you want more info on this product check out this weeks Product of the Week. Speaking of sell outs, Traverse City, Bayshore Half Marathon on Memorial Day weekend has hit its entry limit and there are few spots remaining in the Full Marathon. Running is alive and well in Michigan and I believe its a positive sign that our economy can recover, heck, runners are smart, dynamic people that can turn it around and make it happen! Lets get to work! For more Run Reading, click here: Is Running Healthy? February 20, 2008 - There is no magic when it comes to getting out the door. There is no magic when it comes to getting out the door, plenty of tricks to help but alas, no magic. Once out the door, the magic happens, so get past the door! I came across Peter Neilsons fitness show on the radio yesterday. Peter has had huge success as a trainer, health club owner and media fitness guru. Truly a body built in a gym kind of guy coming at fitness 180 degrees from the way a runner arrives at it. I often joke about the fact that as a runner, Ive never had to exercise, how cool is that! On the show he answers a question on cardio equipment and what was the best work out. He answers by rattling off a bunch of numbers such as time on and calories burned and suggests the elliptical machine as the best. As a runner and closet triathlete, I can torture myself onto a treadmill or bike trainer if its my only option to getting outside but the idea of getting on some abstract machine that has no benefit to making me better at my sport (other than some aerobic conditioning) is painful to think about. Sport specific training is where it is at, that is, using the muscles in the way they are used in your sport. Welcome to the sport of elliptical! What? For more Run Reading, click here: Running Fast: Form, The Last Frontier.